Discussion of coatings selected for deck remediation where the decking has been exposed to Phenolic Foam Insulation (PFI). In 1991, the major industrial coatings manufacturers of the United States were contacted by Beazer East, Inc. through a consulting firm. 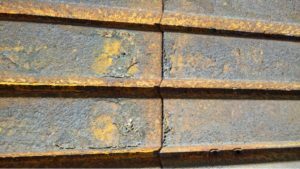 These coating manufacturers were presented with the problem of specifying a surface preparation and coating system to be applied over corrugated steel decking that had been in direct contact with, and/or corroded by, Phenolic insulation. The coating had to be able to be applied to both painted steel and galvanized steel decking. Phenolic insulation exposed to humidity or direct moisture (such as roof leaking) creates sulphonic acid. In a short amount of time, this sulphonic acid corrodes both standard painted deck as well as galvanized deck. It is important to note that the coatings used to paint corrugated decking are applied at a thickness of between one half and three quarters of one Mil DFT. That is less than one thousandth of an inch. A sheet of newspaper is three thousandths of an inch thick. The phenolic insulation also has a history of crumbling, and easily crushes when walked on, leaving a residue on the decking. This residue is present regardless of whether the insulation has been crushed or not. In order to have corrosion, three things are required, oxygen, moisture, and a catalyst. In our case, the catalyst is the Phenolic insulation residue and the sulphonic acid. In order to prevent corrosion in this application, we would need to remove all the residue, which is not practical. 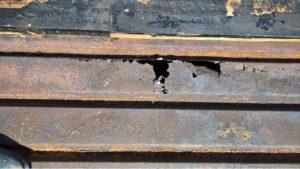 The easiest way to prevent corrosion is to prevent moisture from coming in contact with the phonlic residue and the existing corrosion or steel by means of a high build barrier type coating. When developing a specification for surface preparation and coating selection, there are limitations to what surface preparations are available, possible, and practical. When making a coatings selection there are also limitations as to the occupancy of the building and limitations of surface preparation, and the skill level of the applicators. Any change made to the surface preparation will change the selection of the coatings system used. When reviewing the possible surface preparations, we are limited in the sense that many of the industrial surface preparations, such as abrasive blasting or water washing, are not practical. 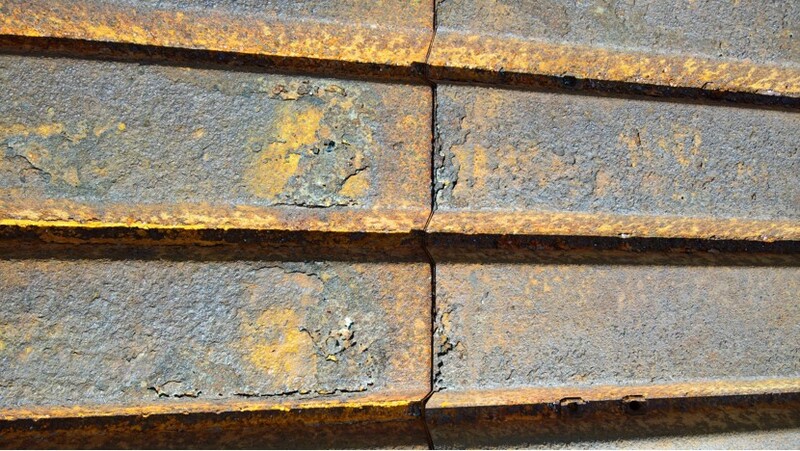 Regardless of what practical surface preparation is chosen, we know that corrosion and the sulphonic/ phenolic residue will remain on the remaining surfaces. It is not practical to completely remove the residue or the corrosion as it would be less expensive to just remove and replace the deck. For our surface preparation specification, we use the Steel Structures Painting Council SP-2 hand tool clean or SP-3 Power-tool clean. The level of cleanliness for these specifications are the same, the difference is the methods used to reach the required level of cleanliness. 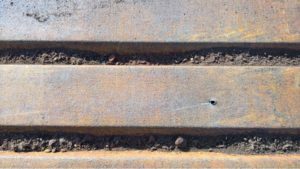 After examining the profile of decking that had been corroded by sulphonic acid/phenolic residue; we found after cleaning, that the profile or depth of the corrosion ranged between two and eight thousandths of an inch (mils). This meant that our minimum dry film thickness required to cover the deepest profile was at least nine (9) mils. 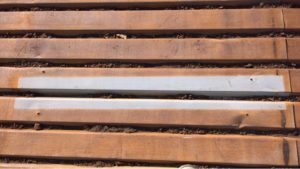 The profile of the corrosion directs us to a high build coating which is also surface tolerant given that corrosion will remain on the steel decking. This coating must be able to be applied to and adhere to existing coatings, without lifting, and adhere to galvanized decking. It is not that the sulphonic acid is so damaging, it is that the insulation boards will hold around 10 times their weight in water allowing it to stay continuously wet and dissolve the deck. 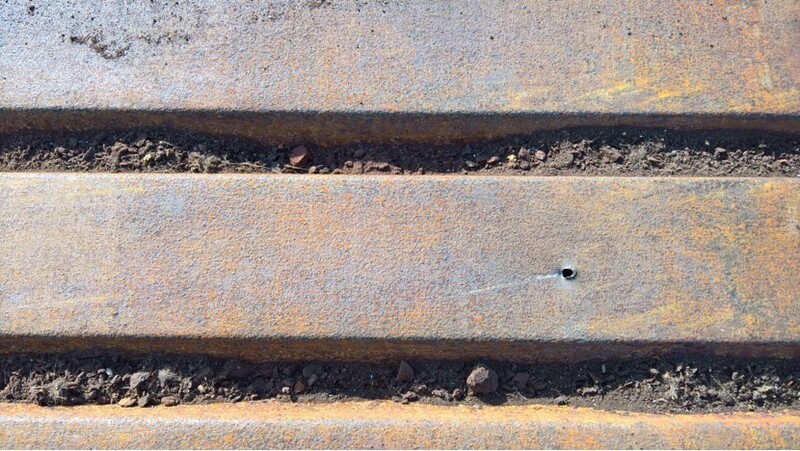 This is typical of the damage, full, active corrosion from top(flange), down the slope(web) into the bottom(flute). The dust is mostly crushed insulation. The phenolic foam dust cannot be fully removed without washing it from the deck. The previous roof system was mechanically attached using screws that penetrate through the decking. In areas where the roof has had leaks, these fasteners/screws can be completely corroded through leaving the screw head and washer on top of the foam and the end of the screw falling into the building. This section of decking has been completely corroded through. The section was prepared, coated and overlaid with new decking. -Acrylics (typically 35 to 50% volume solids*) meet neither the surface tolerant requirement nor have the ability to be applied in thicknesses greater than five (5) mils dry (DFT dry film thickness). -Alkyds (typically 45 to 60% volume solids*) have limited surface tolerance but do not meet the high build thickness requirement. Also oil based coatings contain oxidizers which are the drying mechanism (along with solvent evaporation), these oxidizers continue to “dry” the coating until no oil remains, thus leaving a dry powder residue which has no barrier properties and will allow the deck to corrode again. Oil based primers are typically applied between 2.5 and 4 mils DFT. -Standard Epoxies (typically 60-75% volume solids*) can meet the surface tolerant requirement but not the film thickness requirement. Typically applied from 3 to5 mils DFT. *Volume solids are the amount of liquid in the can that actually forms a solid film. Any part of the coating that is not volume solids is solvent and needs to evaporate out of the coating to ensure proper curing. Only volume solids have film forming characteristics. In all three of these cases, applying the coating at a greater film thickness than designed in the formulation process will cause solvent entrapment due to the low volume solids. This will lead to continued corrosion because the film becomes very porous due to the solvent bubbles/blisters working their way to the top of the film. A cross section of these films looks very much like Swiss cheese. Epoxies can cause osmotic blistering as the uncured coating pulls moisture through the film and back down to the substrate (decking). High Build Epoxy Mastics (75-100% volume solids). Epoxy Mastics, when formulated properly allow for surface tolerance, moisture impermeability, high volume solids, and high film build. Not all high build epoxy mastics are surface tolerant; many are formulated to be a build or mid-coat in a three coat system or as part of a lining system where chemical immersion will be the end application, requiring abrasive blasting and the removal of all contaminants to clean steel. The coatings we have selected are formulated meeting our requirements and have been tested on steel decking that has been removed from buildings that have had Phenolic insulation on them. The coatings that we have selected meet both the surface tolerant requirement and the high build requirement. When deciding on a coating, we looked for surface tolerance moisture impermeability, adhesion, film thickness, and, specific to our application, ease of use. For this application we had to keep in mind that the coatings would be applied by roofers and not professional painters. In most cases, these roofers need to be taught not only how to prepare the decking, but the proper application of the coating, and the use of the spray equipment to apply the coating. In consideration of the project limitations we look at how easily the coatings can be mixed together (how they “handle”), how easily and with what type of equipment they can be sprayed (standard airless or plural component), and the pot life or working time before the coating sets and cannot be used, and if there are any limitations due to weather/temperature. The difference between the two coatings is more than simply a matter of odor. The first epoxy recommended/used is Sigmacover 7428 ST ( Sigmacover 7428 ST is discontinued now look at US Coatings DeckGrip 6120) which is an 85% volume solids surface tolerant high build epoxy which is applied at 12-14 wet mils, and curing to between 10.2 and 11.9 mils. As it is a high solids epoxy, there is odor from the 15% solvent and the inherent odor of the ingredients that make up this product. The second coating that we recommended/use is Sigmacover CSF 5484 (CSF = Cold Solvent Free,( Sigmacover 5484 ST is discontinued now look at US Coatings DeckGrip 6520) meaning it will cure at ambient temperatures and is solvent free). The DeckGrip is a 100% volume solids, low-odor high build surface tolerant epoxy which is applied at 14 to 16 wet mils curing to 14-16 dry mils. That the coating is solvent free is not the only reason that it is low odor, the ingredients of the product are very low odor in and of themselves aiding in the “low odor” facet of this product. It is erroneous to assume that all 100% solids epoxies are low odor. The GripLine family of products are used extensively as tank linings ranging from potable water to refined crude oil products. It is because there is very little odor that we tested and recommended this product as it met all of the requirements. The DeckGrip has been used for the past several years on all facilities handling Pharmaceutical, Produce, Brewery, and Grocery, Hospitals, and office building/complexes (including the Youngstown, OH Postal Clearing Center) where both odor and airborne solvents are an issue. It would be easier for us to use the CSF 5484 or CSF family of products on all Phenolic projects but the cost is almost twice that of the standard epoxy, and in a number of cases, this low odor product is not necessary. Coatings testing: Both of these coatings were applied to samples of decking removed from buildings that were being remidiated. 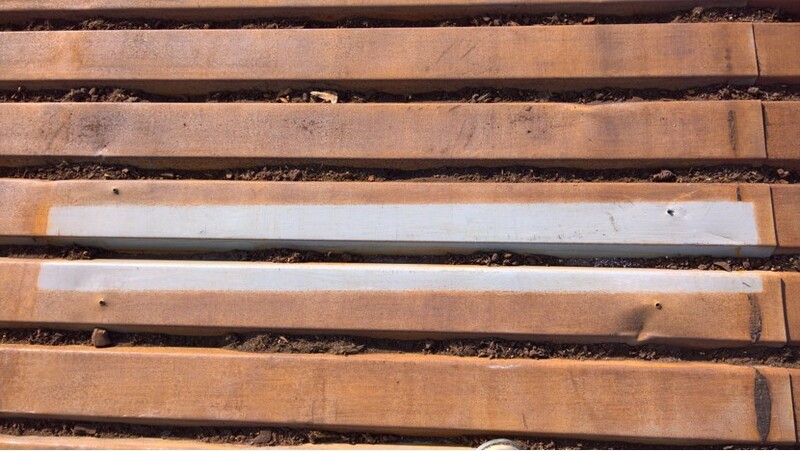 The panels were separated by degree of corrosion ranging from very little corrosion to being corroded to the point at which the decking would be replaced rather than coated. One half of each panel was hand prepared as per SSPC- SP-2 and the two coatings were applied at the recommended film thickness. The panels were then laboratory tested in 100% condensing humidity. After 2000 hours, the panels showed no blistering or delamination (loss of adhesion) or other failure. It is important to note that in 14 years and over 3500 Phenolic deck remediation projects no system that we have recommended has failed. In those 14 years, we have supplied over 700,000 gallons of epoxies to projects involving deck remediation where the deck was exposed to and was in direct or indirect contact with phenolic insulation. The John’s Manville projects that we have completed, the Sigma Coatings/US Coatings have been specified by architects, engineers and roof consultants. These specifiers consider the products, application, performance and the field personnel put in place to aid the contractor in project start up. US Coatings as a company gives a warrantee against active corrosion on every project that is completed using their coatings. A power broom fitted with a 100% wire brush head is used to prepare the deck to what approximates an SSPC-SP-2/3 level of cleanliness. The deck is blown clean after power brooming. This cleans the dust and debris out of the bottom of the flutes. The phenolic foam dust is too fine to be efficiently vacuumed as it quickly clogs vacuum filters. The airless sprayer is fitted with a dual spray nozzle which allows the web-flute-flange to all be coated at the same time including the web that is facing away from the applicator. Using the DSN greatly increases the production rate of application and reduces the amount of wasted paint caused by making too many overlaps or going back to cover missed areas. An applicator should be able to properly coat around one full square of roof area per minute which represents 100 sq/ft of floor area and is actually 135 sq/ft of coated surface area. The new roof insulation is immediately laid into the wet DeckGrip as the roof area is coated. The finished application at 14-16 wet MILS. No, Yogi Bear was not taking the pictures….